A crochet leaf is such a nice accent to your crochet flowers. It gives them that great finished look. That’s not all they’re good for, though. You can use them for so many things; to make decorations for around your house, appliques, or attach them to those heartwarming gifts. They’ll work great for whatever you decide to use them for. There are also so many different patterns and designs for crochet leaves. You’ll be sure to find that perfect leaf for your project. I’ll start with a walk-through of a great pattern for a simple leaf. I like to make them in autumn colors, but you could make them in any color you want for any time of year. This pattern is so fun and so easy to make. You’ll find yourself making dozens of them before you know it. If you’d like a diagram pattern for this leaf you can find it at Susan’s shop above. Use medium weight yarn and a size I or J hook. I started my leaf with a magic ring. However in the actual pattern she starts you in a different way. You can work the ring, whichever way works best for you. Keep in mind, though, that the pictures correlate to my working the magic ring. Susan's Directions: Ch 1, tighten to form a knot. Ch 2, join to form a small ring. I started with a magic ring. If you need instructions on a magic ring, you'll find them here. Join and and close circle. This is where the pattern ends. You can tie off and weave in the end. I like my stem to be just a bit thicker, so I add a few slip stitches. Here’s what I did. Ss in second stitch from hook and in each ch back to main leaf. I told you, so easy and so fun to make this crochet leaf, right! Here’s another great leaf. This one is just so, so simple. There's only 1 round! Crochet-Basics Hint . . . 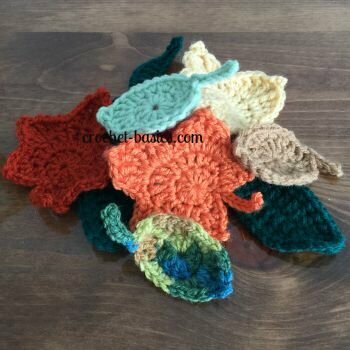 Remember, you can make any of these crochet leaves larger or smaller by adjusting your yarn choice or hook size. The have a nice triangular shape and are perfect for crochet roses. They have a flat side that makes them easier to attach to your flowers and leave the point sticking out. Ss in base of leaf. That’s it, you have a violet leaf. I told you, just super easy! I just call this one a basic crochet leaf. It's nothing too fancy, but can be used just about anywhere, which one reason that I love all these leaves. They're quick and easy and look great! You can stop here and finish off and weave in your ends. Or, you can give your leave a little extra edge, as follows. Have fun making a crochet leaf or two or three. Remember these are great as green leaves but also beautiful in reds, yellows, oranges, and browns for autumn. Try variations of the patterns and then come back and tell me all about them!